Post done, now the test, anyone have anomalies, copies that don’t fit? Send them in, two added to foot of post already. Discogs needs to up its game from sometimes maybe a mention Van Gelder, or no mention, , to separate entries for East Coast and West Coast editions. This is important and it has been wishy-washy for too long. I have plans. “People say I am two-faced. I ask you, if I were two-faced, would I be wearing this one? One of the many joys of record collecting is decoding the physical variations of analogue manufacture, entirely absent from mass-produced digital formats. Original recordings appear over successive years with many different faces. There are lots of details to become familiar with, text, symbols, iconic designs, squinting at the surfaces of the vinyl land surrounding the label. 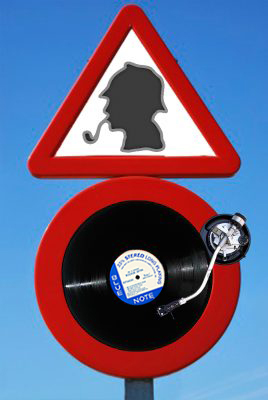 Jazz record collectors are mere dilettantes compared with vintage singles and Beatles collectors. 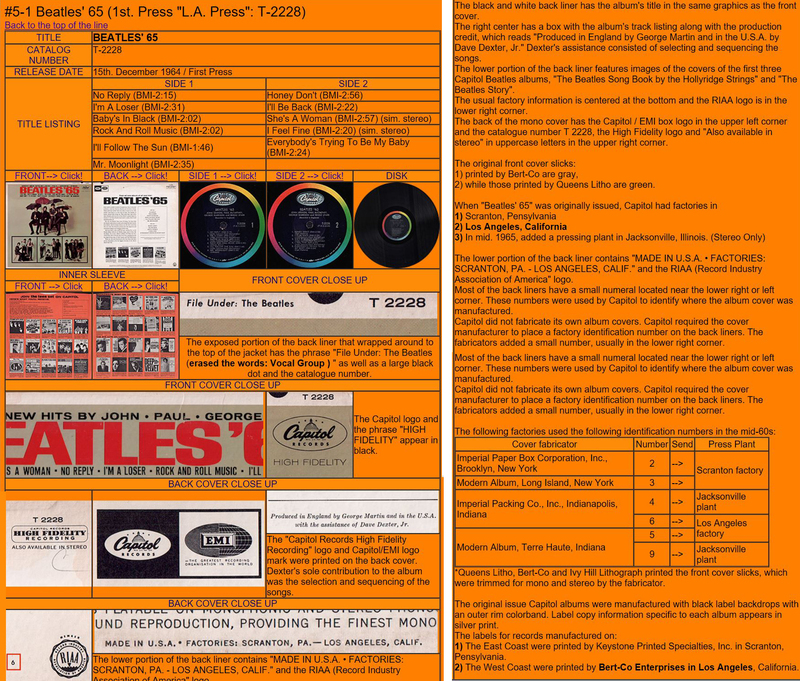 The Beatles obsessives, with their encyclopaedic knowledge of record labels, pressing plants, printing plants, factory codes, and operating dates, have signposted the way for others. What this level of detail looks like for merely one album is shown below, which in passing, provides a useful guide to record jacket manufacturer codes. So now you know a 2 is Imperial Paper Box Corp., Brooklyn, impress your friends.You will also see the link between the Cover Fabricator, the Centre Label Printer, and the Pressing Plant, a link that will be useful as we proceed. The recent post on Freddie Hubbard’s Blue Spirits got me thinking. “unusual, LJC thinking” you say. With original Blue Note records spiralling financially ever upwards into investor and elite-collector trophy territory, the successor to Blue Note, Liberty Records Inc., inherited almost all of the precious Blue Note cargo. Not always reissued to best advantage, and sometimes dismissed as mere “re-issues, not the first original”, which actually means undervalued in comparison. They are the source of some of my best sounding records, pretty much original Blue Note quality with ten years less wear, not cheap, but not costing an arm and a leg, more just a couple of toes. Unlike original Blue Note, the Liberty Years are still not well documented to meet collectors needs. I made a start in the LJC Guide to Blue Note, not yet at the level of a true Second Pressing Fundamentalist. Most of my internet queries end up pointing me to my own pages. Now the search is on for the best of Blue Note, A Division Of Liberty Records Inc., and how to find it. The Cheapskate’s Guide to Blue Note. LJC is going off-piste again, fewer footprints to follow, more trees to crash into, but the excitement of virgin territory. The source information is a change from scouring the internet: my own collection of 104 Liberty label issues. The essential clues are in the forensic detail, and too many eBay seller pictures are inadequate for this task – some offer only a picture like this: telling you more about their taste in soft furnishing than about that record. First , we collect the pieces. July 1966: thirty five Blue Note titles in preparation, then Blue Note is sold. You probably all know this already but I want to clear it out-of-the-way first. So, a quick recap. 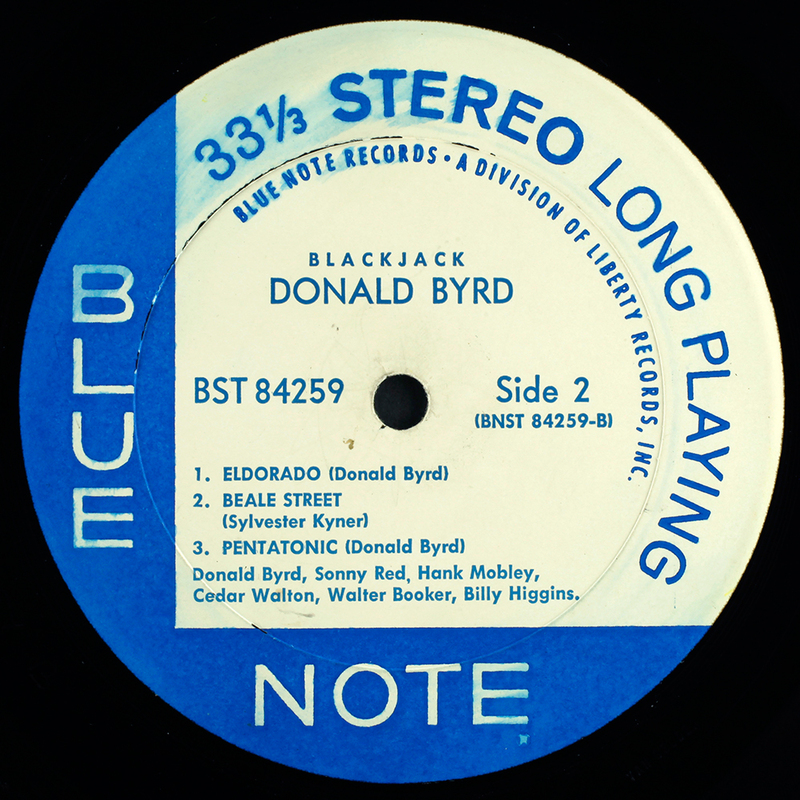 Blue Note had thirty-five titles in preparation prior to its sale to Liberty. Session dates held and recordings made, takes selected and approved, tracks sequenced, Van Gelder mono and stereo masters cut (VAN GELDER stamp would later appear on pressing), catalogue number allocated, centre labels printed, covers manufactured, liner notes written, printed and pasted-on jackets. 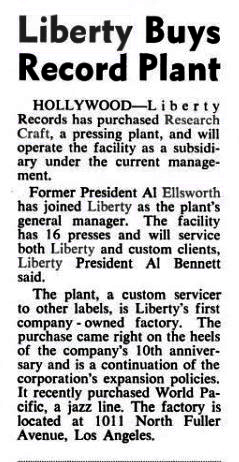 All that remained is actual pressing, which Liberty did, through their New Jersey All Disc Records plant. Novices worry about the resulting absence of the Plastylite P, and sellers hype the presence of “original NY label!”, only rarely do you see the words “no ear!” These are the “original” Blue Note first issues, no previous issue exists. Strictly speaking they are not “original Blue Note” but first issues by the Blue Note Division of Liberty Records Inc. Now forget these, we’ve other fish to fry. Apart from the 35 post-sale titles, Liberty is of potential interest for reissues of prized Blue Notes from the period 1956-66, one of several options for the collector whose budget doesn’t run to the eye-watering price of original Blue Note. That’s most of us. Then there is great music among the 140 new titles added between 1966 and 1970. New issue or back catalogue, it’s most likely to be stereo, but we won’t talk about that (for now), should be Van Gelder mastered (but sometimes isn’t) and much more important, affordable (though not always). They “all look the same” until you practice LJC COMPARE™, same-size multiple copies side by side, when you see immediately they are all different pressings, with different label printer/pressing plant combinations. It is a far cry from The Blue Note years, when all a collector had to do is remember three addresses, 47 West … Sixty …umm…Sixty…what was it again? Liberty reissued titles from the back catalogue they considered had most commercial potential, to be manufactured by their newly acquired East and West Coast plants (and eventually supplemented by others). Pressing records close to markets reduced distribution costs, which made business sense, but another decision made less sense. Rather than ship original metal parts from NY to LA for pressing those reissues, Liberty mostly shipped just a copy tape, to be re-mastered locally. Original metal parts stayed in New York for use by East Coast plants. With a West Coast pressing, instead of original Van Gelder/ Scully/ Westrex mastering, you are most likely to get a generation drop from the original tapes and another engineer with different working practice using whatever equipment they used locally, the way they thought best. Division of Liberty are not all the same, or perhaps they might have been, but for the vexatious question of mastering. . Hello? Are you there, Rudy? Having lineage to Van Gelder metal makes a record pretty much the same quality as Blue Note original but without the “original” price tag. All of my 16 East Coast Div Lib back catalogue reissues are great sounding Van Gelder. However I discovered through this hands-on research, that of the 24 records I now know to be West Coast pressings, (aghast, 24!, clutches pearls) two-thirds are not Van Gelder mastered. Some lack it because there was no previous RVG master in stereo, but most of the time an RVG stereo master existed, but wasn’t used. A few times metal travelled coast to coast but mostly not. Though the precious Blue Note vault would be eventually relocated to the West Coast, Cuscuna will know when, by then, a large number of Liberty reissues of classic Blue Note titles without Van Gelder found their way into the marketplace. Had I known this at the time, my Blue Note collection would now look and sound very different. Reader Advisory: you could of course just stick to buying Van Gelders, whatever the label, but that takes all the fun out of collecting and understanding the vinyl world of the ’60s. This way you get a lot of knowledge that will be useful to you, for other purposes, at another time you don’t yet know about. That’s how knowledge works. Introducing the centre-label printers and pressing plants. Keystone Printed Specialties, Scranton PA. 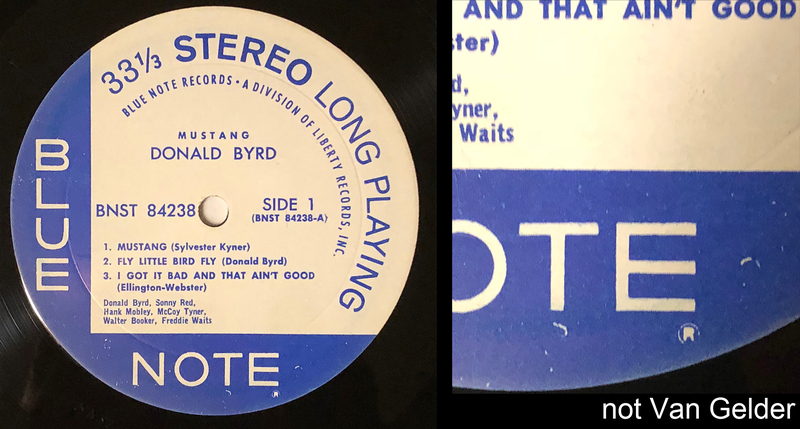 I Photoshopped in the Blue Note labels, but the pictures are authentic and historically “accurate”: Keystone had printed Blue Note centre-labels since the ’50s, possibly earlier, providing consistent quality service, in a close working relationship with Plastylite. Liberty diversified it’s suppliers geographically, divided between East and West Coast operations. 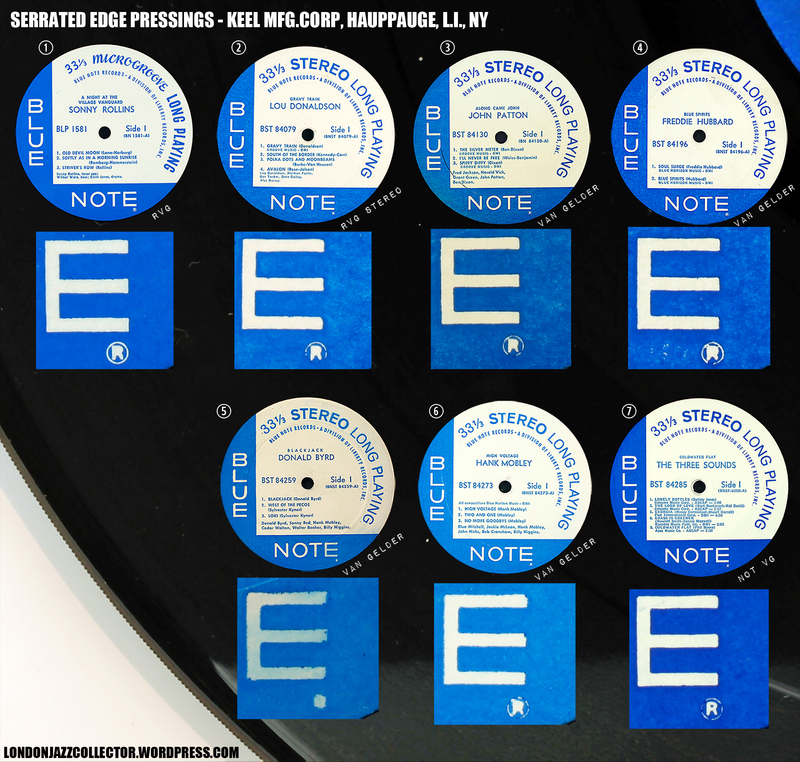 Keystone continued printing Blue Note labels, now “Blue Note Records – A Division of Liberty” Records Inc. centre labels, to the same high standard as Blue Note, destined for East Coast pressings. 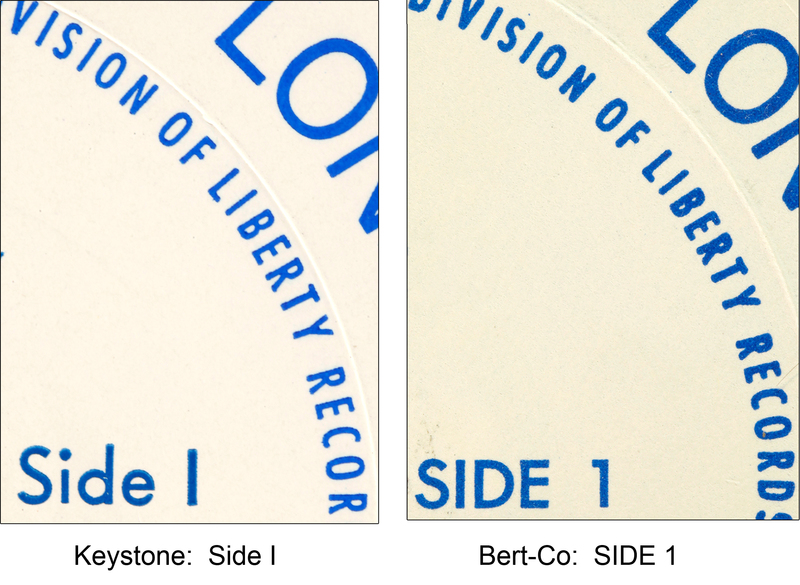 It is worth a closer look at a Keystone label, as centre-label print is an important clue as to who pressed a Liberty record. 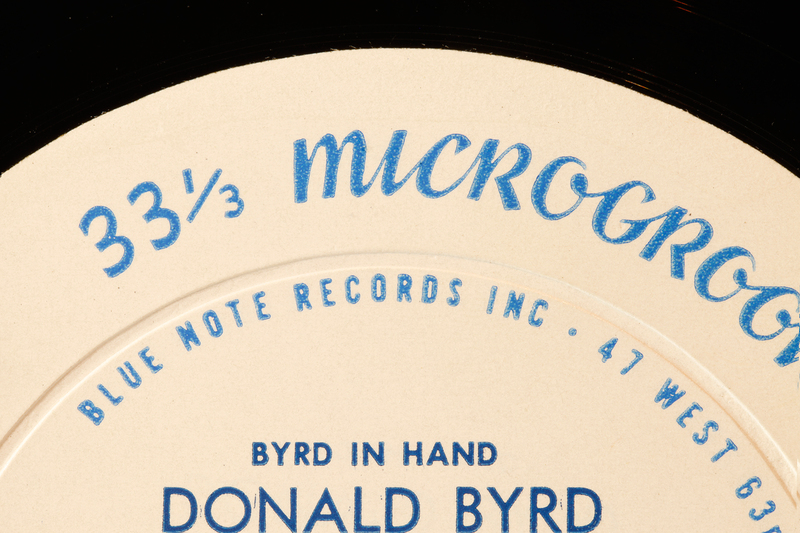 Here in close up, a section of the centre label of the original 4019 Don Byrd’s wonderful Byrd in Hand (1959, deep groove, nice! View at full screen. Keep smelling salts within easy reach) This baby did cost me an arm and half a leg. Interestingly, two different colour blue inks are used: one for the generic corporate text and solid Blue Note design segments, another for the specific title detail and track listing. Looks like perhaps Keystone kept stocks of pre-printed corporate Blue Note “blanks”, needing only to typeset and insert the album specific text to fulfil the order quickly and consistently.That might explain the different colour inks. The corporate text is classic Blue Note blue, whilst the title-specific text has a different, greeny-blue ink, close to Pantone’s “Blue Sapphire”. Note also the fine precisely inked font, general sharpness of print on quality (coated?) paper that doesn’t bleed ink to surrounding fibres. It’s all about “Blue Note quality”, and it links the Keystone label to All Disc Records. Crikey. Twenty four presses, three times the capacity of Plastylite. Ambitious sales plans by Liberty, those numbers tell a story of their own, perhaps Plastylite couldn’t offer the growth in volume Liberty wanted. All Disc pressings sound pretty much the equivalent to Plastylite, given many are Van Gelder recording and mastering, though the vinyl weight is a telltale difference. NY label pressings by Plastylite 1962 through to 1966 weigh on average 166 grams (n=95). All Disc pressings weigh on average 147 grams (n = 63) legacy NY label or Division of Liberty label exactly the same. For their West Coast operations, Liberty began pressing Blue Note locally, using their pressing plant acquired the previous year, Research Craft, Los Angeles. In 1965, Research Craft was acquired by Liberty Records and made their West Coast pressing operation…Their LP’s had a 2.875″ diameter circular indent in the label area. The problem was not Research Craft pressing new Liberty titles, which to confound things are often Van Gelder mastered. The problem was the cherished Blue Note back catalogue reissues, which on the West Coast operated mainly on the basis of Research Craft re-mastering from a copy of the Van Gelder tapes, with unsatisfying audio results. Only 4 of my 24 Research Craft/ Bert Co label are Van Gelder. The initials B. A. appear faintly in the deadwax a few times, but mostly there is nothing in the run-out apart from the catalogue number, written in the same neat small hand quite unlike Van Gelder’s large open hand. Ebay sellers often made mention of the presence of Van Gelder stamp, but usually say nothing when it is absent. No-one mentions “B. A.” – which ironically may stand for bugger all. Illustrated below is a sample of five West Coast reissues, which show the marks of Bert-Co handiwork: malformed ®, capitalised SIDE 1, and more important: none VAN GELDER. UPDATE: note, this is work in progress, new information incoming, there may be much more to be discovered, there may be a question mark over some of the variation in typesetting not yet bottomed out. 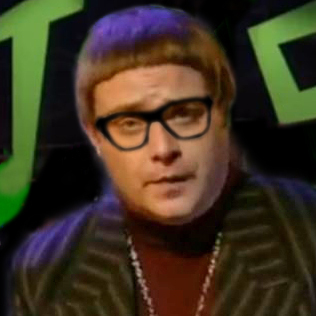 Bert-Co have almost always a capitalised SIDE, and the album title is not small font capitalised, but either same size font as artist, capitalised, or small font but upper and lower case. 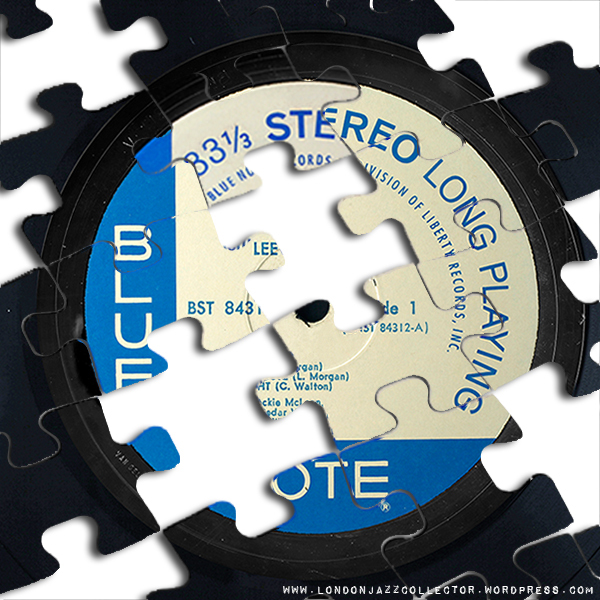 Keystone are small capitalised album title, as are original Blue Note. Hopefully these are consistent characteristics, more research in progress. Research Craft pressings are the least heavy of the Blue Note Division of Liberty pressings, with an average vinyl weight of only 139 grams (n=24), compared with 147 grams for All Disc and 166 grams for original Plastylite (1962-66). Does Vinyl weight matter? Intuitively yes, any engineers out there are welcome to call me out, I’m just an amateur . Greater weight = more stability, opportunity for more groove depth (louder?) and greater protection from surface damage. I remember sneezing at a sub 100 gram pressing and it has sounded since. The pressing plant – print supplier connection points to Bert-Co, the label printing giant of Hollywood, CA. However be warned may not be the whole story – there is evidence emerging of other printers and pressing plants, especially towards the end of the decade, the years of influence by Transamerica, United Artists lurking in the wings and Westcoastification, cutting longstanding ties to Englewood Cliffs and Van Gelder. Bert-Co was founded in 1930 by Berton P. Couturier (what a great name! ), as a print shop on Broadway Street, downtown Los Angeles. By the 1950’s Bert-Co had moved to 4862 Santa Monica Boulevard Los Angeles, (now Michelle’s Donuts, voted 4.5 stars by 8 diners. Sound tasty! I wonder if they deliver?) Their specialty had become imprinting the center labels for vinyl records, and record jackets for many major record labels, including the first record jacket printed in the U.S. for The Beatles, a distinction repeated ad nauseam on the internet, but little else has been written about them, Berton seems to have been camera-shy, and I found no pictures of the factory, maybe these people don’t value their roots, wouldn’t be the only ones. Bert-Co West Coast centre labels include the music publishing rights for each track, and track length. The East Coast labels initially omited publishing rights and timings but instead, list the performing artists names, in the traditional Blue Note format, front-line first, rhythm section last. Over time, more and more label space became devoted to composer and music publishing copyright agencies. One further distinguishing mark between different label printers (and associated pressing plants) is the typesetting and resulting print quality of the registered trademark ® below the E of NOTE. 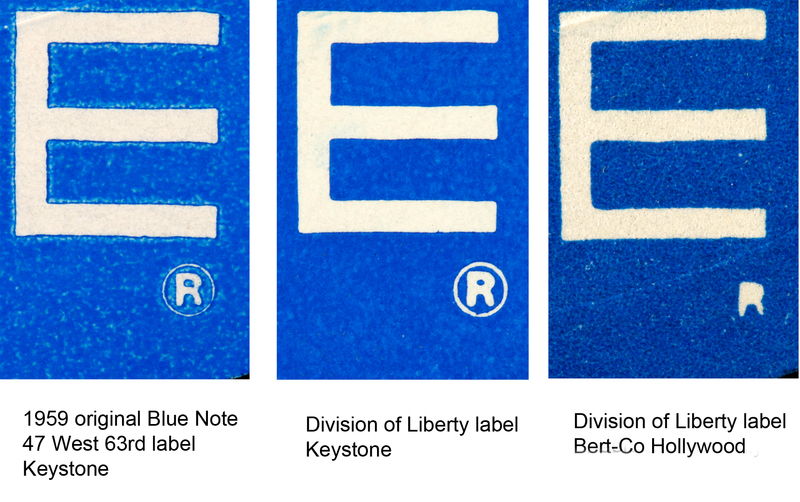 Keystone had been including the ® on Blue Note labels since 1959, so they have a head start. Keystone print quality continued to improve, the blue colour ink is more dense, type sharper and more legible, and the registration mark is perfectly formed. Bert-Co was unable to get its mojo around that ®, so poorly formed, centre-filled, you can even spot it on poor photos on auction sites. The serrated rim edge is believed to be a characteristic of Keel Mfg. Corp, 10 & 15 Gilpin Ave., Hauppauge Long Island, NY,. Keel was an arm of the giant Pickwick Records budget record operation, had massive capacity (a decade later, in 1978, there were 45 presses at Hauppauge) and their own printing facility, which meant they were in a position to fabricate their own Division of Liberty centre labels. There is unresolved speculation on Hoffman as to other plants responsible for the serrated edge, but forum member suggestions are wide of the mark on location and year of manufacture (1966-69). My money is on Keel, convenient NY location to supply Van Gelder metal, its own in-house label printing facility, and likely spare capacity for custom clients. I eventually found seven serrated-edge Liberty in my collection, centre labels pictured below serrated edge background. The ® registered trademark symbol is a game effort, not Keystone sharp, a malformed blocky R (over-inked) with a faint circle. 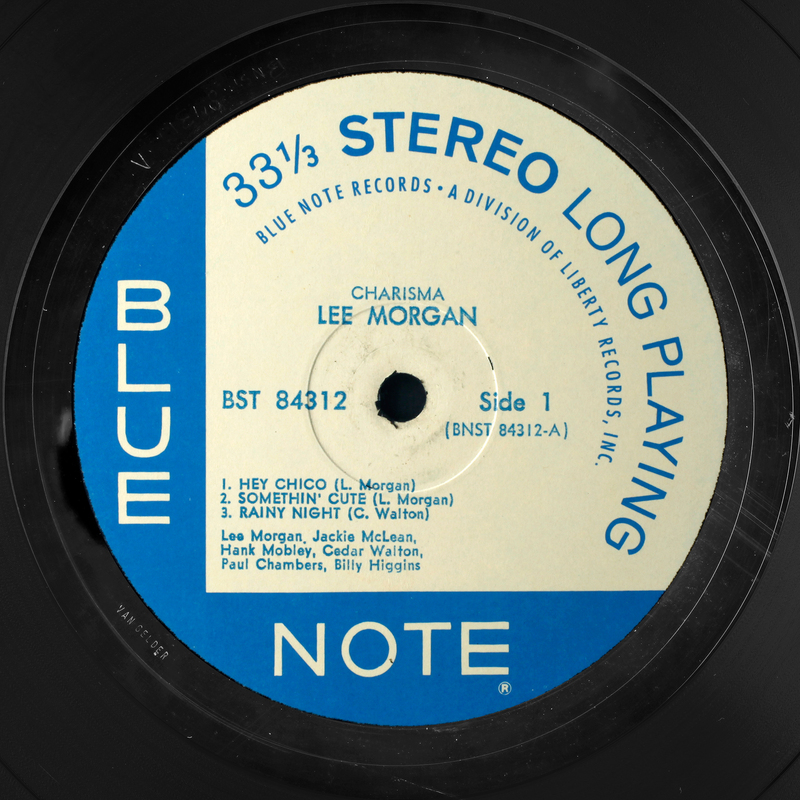 The label design copies the traditional Blue Note format – track title, composer credit and artists, no track length or music publishing rights. #The puzzle piece that doesn’t fit is the use of two colour inks, exactly as Keystone. Some days I think they are Keystone labels, but does not explain the poorly printed ®. All Van Gelder except 84285 The Three Sounds. Perhaps Rudy didn’t much fancy the gig, it’s a record perfect for those who have difficulty sleeping. Just to disabuse anyone thinking that pressing records was a glamorous job, the outside and inside of Capitol Records, Scranton, PA. below. The guys look happy, don’t they? Just not much. This fourth distinct variation exhibits a central pressing ring not found on any other Division of Liberty pressings, but associated with Capitol Records. The central ring is pretty well identical to this sample of a Beatles Capitol pressing (below left) at about the same 1.18″ diameter, though the Liberty lacks the Capitol outer ring, which may or may not be important. Capitol happened to have a record pressing plant in Scranton PA, which happened also to be the location of Keynote Printed Specialties. The Capitol pressing ring above found on these six copies is not unfortunately of the diameter most frequently cited – 1.25″ or1.5″, but 1.18″. (WB on Hoffman cites the following “Capitol used 1.5″ diameter for Jacksonville, 1.5625″ diameter for Los Angeles, and 1.390625″ diameter for Winchester.”) I measured the ring a half dozen times and it measures 30mm in diameter with a school 12″ ruler., which in decimal inches is 1.18″. I can’t measure anything to six decimal places. What engineering tool do I need? 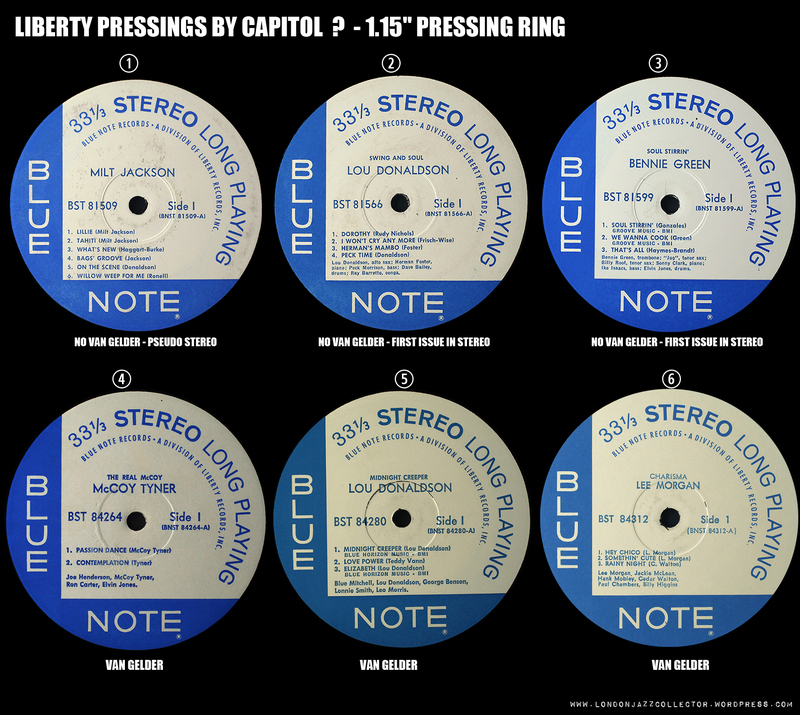 All the Liberty “Capitol” pressings have Keystone printed labels with the well-formed ®, and have Van Gelder stamp where expected. Of the three pressings without the VG stamp, none was expected, as Van Gelder had never mastered those recordings in stereo. 1509 is pseudo stereo, and 1566 and 1599 saw their first issue in stereo by Liberty. Neither, it has to be said, is a very pleasant experience – two-track tapes intended for mono. There are no other identifiers, etchings or symbols in the run-out apart of these Liberty Blue Notes, apart from the Catalogue number. According to some collector sources, records pressed at Capitol’s Scranton plant should have a “Triangle” stamp in the dead wax containing three numbers/letters. These don’t, perhaps because they were a contract pressing with Liberty supplied Van Gelder master stampers, and no-one messed with them. These are the heaviest Division of Liberty pressings. My copies have an average weight of 150 grams. and I have to say they all sound great. Bestway Products pressing plant, 1125 Globe Ave, Mountainside, NJ noticed on my copy of Booker Ervin’s stellar Blue Note title The In Between. This is the only Bestway found in my collection, unarguably a Keystone- label, Van Gelder metal, and a Bestway stamp. Sounds absolutely great. Tyra! That track is so beautiful it would take a month of Sundays to explain why. Blue Note quality lives, on and on. It’s not quite all so neat and tidy as I have packaged it here. There are anomalies, Keystone with capitalised SIDE 1, Bert-Co with Van Gelder stamp, unexplained typesetting variations, I’m still working on it. I can live with anomalies – but can they live with me? Tidy up is for another day. Unfortunately for a Brit, I have not the slightest interest in The Beatles music, neither at the time nor today, but their record manufacture logistics is actually very interesting: reusable knowledge. A lot of typesetting variations are coming to light in further reseach, keeping an open mind on multiple sources of label printing. My Division of Liberty Freddie Hubbard Open Sesame, what a joy. I saw some cheeky mono promos of new Liberty titles whose commercial release was only stereo. Highly desirable. As for the rest, may be you have some stories to tell. 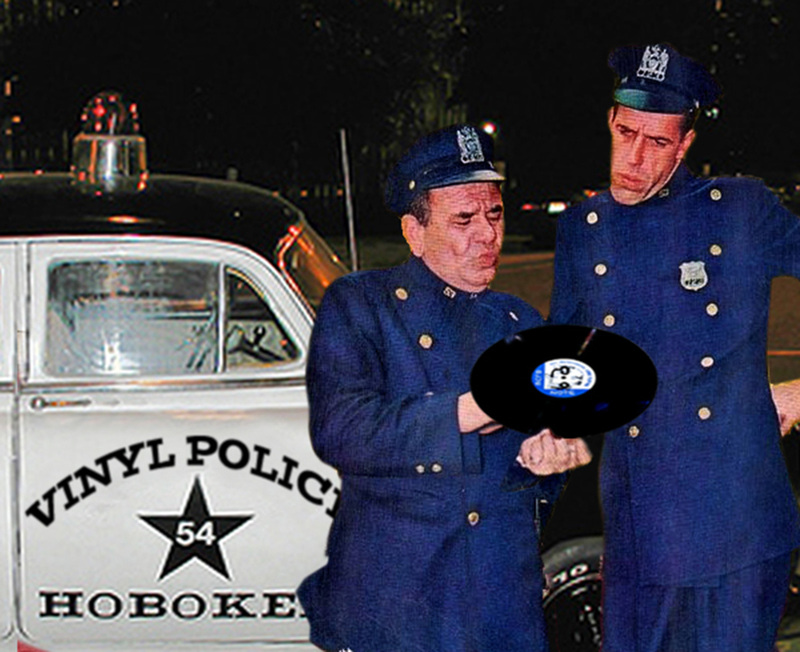 Join the Vinyl Police, pull over your collection, ask to see their label. This is work in progress, first draft, you may know better, throw in your thoughts, I may just have to pull the puzzle pieces apart and start over. I just connect the dots, more dots may be different picture, happy to be corrected, you have to start somewhere. Lao Tzu: The journey of a thousand miles begins with one step. Unusually, this was a rather l o n g step. Another puzzle piece. Rolphe A has sent in a label of 84291 Bobby Hutcherson Total Eclipse that raises the spectre of another pressing plant and printer, one I’ve not seen before. My copy (left) looks to me a Bert-Co label, and the only oddity is the etched “re” after the catalogue number. A “Recut”? LJC COMPARE™ : Rolfe’s copy has an important difference, revealed quickly by physical side-by-side comparison. His copy looks like it may been mastered to a different groove-width: there is an extra half band trail-off in the vinyl land where the grooves finish, so either the lead in groove starts sooner, or the grooves are more tightly spaced. I wasn’t expecting that. It also has a quite different pressing ring, which I have not seen on a Liberty before. Below is another copy found on the net, which adds the insight that the pressing die mark is sunk into SIDE 1, and slightly pushes out SIDE2, which otherwise has simply the usual outer rim step. Neither pressing has Van Gelder, because it was recorded at 8th Floor studio of Plaza Sound, N Y C, recording engineer George Sawtelle. To hear what sort of job Sawtelle made of it, LJC happened to blog the record shortly after Hutcherson passed away. Great! A new piece piece of jigsaw that doesn’t fit. If you have more anomalies, feel free to send them in., but be sure to give it your best shot, or scan. Rolfe’s done a great job, thanks. If you have any thoughts, bring them to the party. UPDATE 2: Why so many shades of blue? When you set off down a rabbit hole, there is no knowing what you will encounter next. 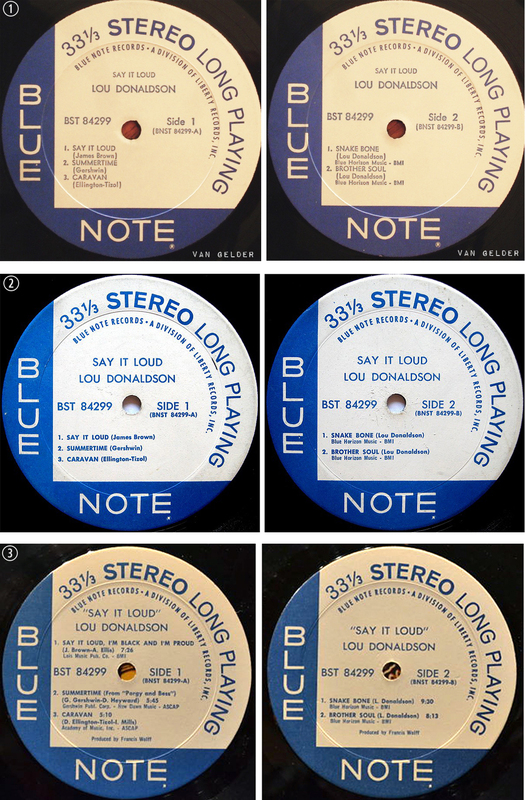 One thing that has been nagging at me is why so many different shades of blue on all these Blue Note labels? You know, it’s called BLUE Note for a reason, and it can’t be just be that the printers were not very good at printing. 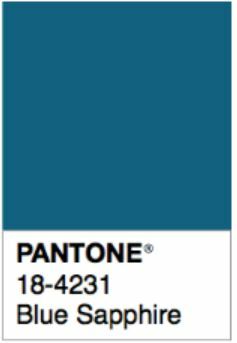 A little research into colour offset printing technology and the Pantone Matching System has come up with a surprising answer. The printing of colour model is CYMK (subtractive) unlike a PC monitor, which is RGB (additive). Nah, I never understood it either. Printing inks are made with resins, varnish, and various types of oil to form a solvent, which combines with pigments which provide the colour. The resin and varnish control the gloss, stickiness, and fluidity of the ink, while drying oils control surface strength, drying time, and set. 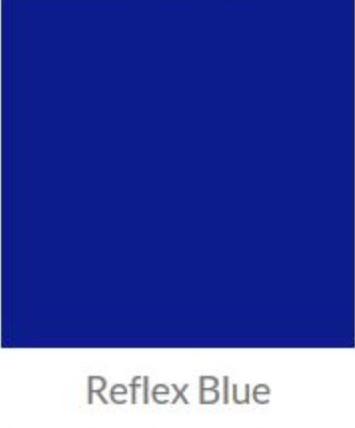 Reflex Blue gets its rich color from a family of pigments known as Alkali Blue pigments. These minerals are very strong in color, and give Reflex Blue its rich deep hue, but at the molecular level, the pigment is highly porous like a sponge. The pigment resists drying, to the point where, depending on the paper stock, it is said it will never fully dry out. Blending with other shades of ink, such as the lighter Process Blue, or adding yellow to deliver a greenish blue, improves stability and drying time, at the price of losing the rich intensity of blue, or much longer drying times need to be allowed, and more costly types of paper stock used. 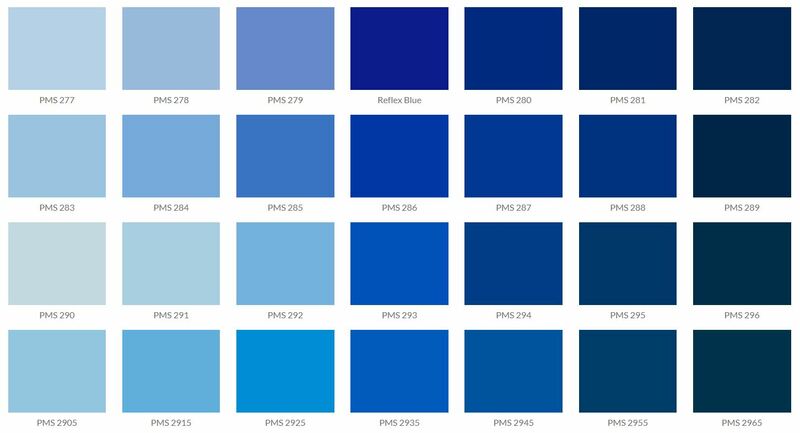 Blue may be the colour of Blue Note, but it is the colour that gives printers the blues. Literally, it’s Blue Murder. The colour deviation from pure intense blue by printers is a technical decision to minimise the complications and problems that accompany it, resulting in different choices how to interpret the colour. I knew nothing of this until today. I knew there had to be a reason I just didn’t know what it was. Now I have an inkling, and I’m Kind-a-Blue about it. Or maybe I’m slowly turning into a Smurf. Record 1: a prized Van Gelder, unlike the other two. Signs of an East Coast pressing though the colour fidelity looks way off, suspend judgement who made it. Songtitles with composer credits, but Lou has got in his BMI copyright registration. Record 2: same formula as Record 1 but SIDE is capitalised, nice ® and isn’t that pure Reflex Blue? Shame it’s not a Van Gelder. Record 3: hang onto your wallet, the lawyers have arrived! Track 1 “Say It Loud” now becomes a direct quotation from the James Brown composition “Say It Loud, I’m Black and I’m Proud” followed by Brown’s BMI copyright registration with track length. On a roll, Gerwshwin and Ellington get their ASCAP copyright registration onto the label. All three composer’s songwriting credits are expanded to include co-writers: Brown – Ellis, Gershwin – Heyward, and Ellington -Tizol adds an extra writer – Mills. The track “Summertime” becomes (from “Porgy and Bess”) so as not to confuse it with reports from The Weather Channel. The Donaldson compositions which make up all of Side 2 acquire track lengths for the first time – perhaps the track length is integral to the rights claim? As always, follow the money. All attention is now on music publishing rights as opposed to the music performers, who are now completely lost from the label. Another turn down the rabbit hole, that was educational in an unexpected way, whatever next? OK, I’ll answer my own question. More digging, that’s what. Mono issue in 1967? I expect for radio stations, very rare, only pictures I could find but still not great despite considerable retouching, removing perspective, eliminating colour-cast. Why do sellers picture the label at 45 degrees? Stupid. The top pictured East Coast one is Van Gelder, below is the Bert-Co, not. The non-Van Gelder fetched $500, the Van Gelder only $300. No accounting for common sense when the word “Rare!” is bandied around. Must say, it’s very desirable. Issued in stereo for the commercial release, same pattern, one East Coast Van Gelder, one Bert-Co not. These are quite inexpensive compared with the mono. The interesting thing, a pattern taking shape for these 66/67 issues, the typesetting of the album title, a reduced size font above the artist name in both cases, but capitalised for the East Coast / Van Gelder, and upper and lower case with the West Coast not Van Gelder. The second half of the ’60s and early ’70s saw photosetting technology replace hot-metal linotype setting, though it is not known (to me) how these labels were set. I’m not sure it matters. According to US Bureau of Labour Statistics, in 1960, fully half the employees in the printing trade were Compositor/ Typesetters, which may account for the large variation in typeface and composing decisions made by different operators when formatting the same label information. Capitalisation, font choice, font size and abbreviation are all discretionary. The meaning remains legally the same, whether the artists is Wayne Shorter, W. Shorter, or just Shorter. up for the long run. UPDATE 5 January 12: Jackpot! Further research crawling painfully through auction pictures for a Liberty reissue of 4172/84172 Freddie Hubbard’s Breaking Point finally hit paydirt: a mixed label pair – original NY label Side 1, Division of Liberty Side 2. As an aside, the mixed label is a Capitol pressing (UPDATE: further research suggests not Capitol, theory discarded, more likely a mid-way plant, Southern Plastics or its associated Tennessee plant Dixie (who pressed for Chess and VeeJay), not All Disc, but both East Coast and therefore with easy access to Van Gelder metal.. Both labels have common label printer origin: Keystone. and common typesetting – small font capitalised album title above artist name, and Side 1/ Side 2 in upper and lower case, and a Van Gelder. Pity the seller photo is not clear enough to be certain as to the ®. This is the line of legitimacy of Blue Note originals to Liberty. Just to put the nail in the coffin of Bert-Co/ Research Craft, below are the original 1964 issue of 4172 Hubbard Breaking Point. Mono (1) and Stereo (2) editions on Blue Note (Plastylite/Van Gelder) , a Keystone/All Disc Division of Liberty (3) and our Research Craft remastered not Van Gelder with its Bert-Co label (4) , title and artist in equal font size title, malformed ®, and capitalised SIDE. 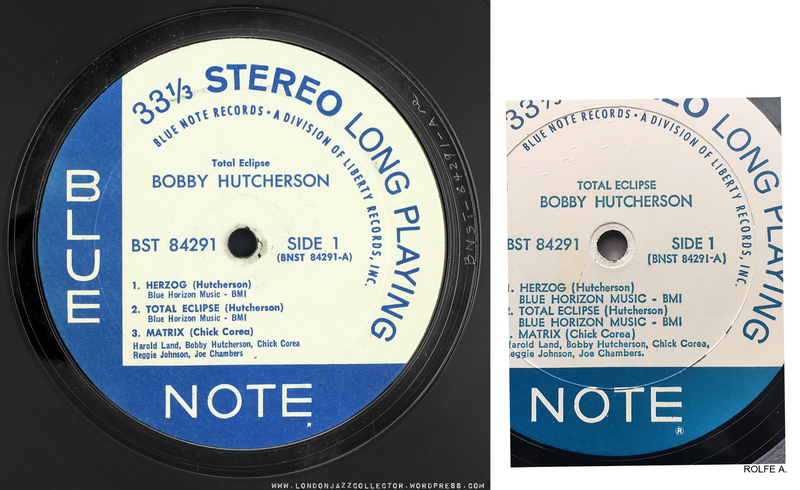 Other examples show a similar Bert-Co variation in typesetting, below right, highlighted here for clarity – 8244 Bobby Hutcherson Stick Up, compared with Keystone/Van Gelder left. The Bert-Co typesetter has opted to type the album title in small upper and lower case, likewise the music publishing rights. The Keystone is Van Gelder, the Bert-Co not. The typesetting would probably have been done on a Linotype typesetting machine. If not, I’ve taken a wrong turn down the rabbit hole, never mind, when you are lost there isn’t a wrong turn, we’ll just end up somewhere else. Unlike mass production of newsprint, a record centre label had to fit a lot of information into a very small space, the complete opposite of a newspaper, which has to fit very little information in a very large space. From the point of view of record label compositing, the keyboard is the most interesting aspect of typesetting, leaving behind the printer’s inky fingerprint. No QWERTY board and Shift Key for capitalisation. On a Linotype keyboard upper and lower case have separate keys, left hand the lower case letters, right hand the upper case letters. A change in font-size requires type from a separate magazine of characters, of which the machine can hold a maximum of four. For most purposes the typesetter worked with lower case and upper case in two font-sizes, large and small, which is more or less what we see on these record centre labels. Except one typesetter has chosen to compose the title in just small capitals where the other has chosen small upper and lower case, or large capitals. Linotype’s 90 keys are arranged by order of frequency as they appear in the English language, not QUERTY or AZERTY, but ESCVXM. The take-way word is however ETAOIN SHRDLU. If you make a mistake, as in life, there is no delete button. It is quicker to pad out the rest of the bad line by running your finger down the first two columns of characters on the keyboard, spelling e t a o i n s h r d l u, and leave it for the proofreader to spot the mistake, and pull out the faulty line. The Star Quadder attachment to the right of the machine (close up, below) automatically performs left and right justification, a task undertaken nowadays by politicians. Well well. 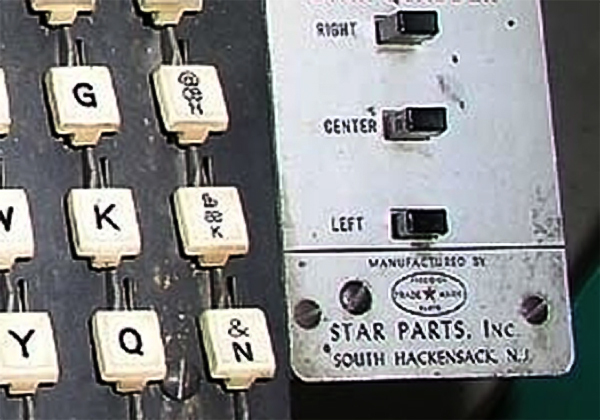 This Star Quadder is manufactured by Star Parts Inc. of S. Hackensack, New Jersey. It’s a very small world indeed! This characteristic correlates almost perfectly – 95% -with the presence or absence of Van Gelder mastering. The remaining 5% are anomalies which have some other explanation, which remains unknown. Here is the full forensic, lots of tell-tale differences, but it hinges definitively on the font size of the album title. Keystone/Van Gelder always as left, never as right two , and vice versa. 100 albums, for 95% it works this way. Four albums, 84182, 84277, 84297 and 84307 are all Van Gelder but clearly with a Bert-Co label. Maybe occasionally metal travelled to the West Coast, or labels travelled the other way, to help out. Then there is 84260, Cecil Taylor, Conquistador, which like the music doesn’t fit any category, both editions – one with and one without Van Gelder, have album title in small font capitals. Perhaps it’s someone’s sly sense of humour, or perhaps I’m beginning to hallucinate after looking at too many labels. Any remaining loose ends will have to look after themselves. And the rabbit emerges from the rabbit hole, blinking, into the sunlight. All the hallmarks of a Bert-Co ( capitalised SIDE, malformed ®, no Van Gelder, but the album title is Keystone-style small capitals. My reference copy is a mixed label Capitol pressing, Van Gelder, with title in small capitals. Below compares the two Side 1’s NY and Paul’s anomaly. I completely overlooked Paul’s catalogue number is incorrectly given as BNST instead of BST. Duh! Amateur Night! 2. Anomaly 84260 Cecil Taylor Conquistador. The wide kerning in the title CO N Q U I S T A D O R looks mighty similar to that in Mustang. Typesetter missed adding a space between the first two letters CO by mistake, then wide spaced the other letters. Perhaps they were not used to setting small font capitals. I think this is a Bert-Co, and by chance the typesetter opted for small font capitals because the title is too long to fit in large capitals as he intended, and the Side u/l case is just an anomaly, chance operator preference. There are two editions of 84260 (possibly more but none found). A Keystone/All Disc/ Van Gelder (below left) and a Bert-Co/Research Craft/ no Van Gelder (below right). This establishes a third Bert-Co variation in the typesetting of the title. On the Keystone we have the title set in small-font capitals close above the artist name, like all Keystone. Unusually, Bert-Co also chooses small-font capitals, however set a large-font character height above the artist name. Exactly. Though the Side is upper & lower case, the 1 is distinguished by its serif as on all Bert-Co, unlike Keystone where it is sans-serif. Just the smallest things eventually betray its origin and the link to r-emastered acetate. This one is a stinker: two editions, one Keystone and one Bert-Co, but both are Van Gelder. Below left, classic Keystone/All Disc. Below right, a typical Bert-Co label, darker blue colour, malformed ®, title set in small capitals a large character height above artist name, and a serif 1. Illustrated below right, full large-character height spacing of title above artist name on the Bert-Co label. It is not certain whether this spacing applies to just certain titles or applies more widely. The fact that both are Van Gelder means that, for some titles, or at some point in time, Van Gelder metal (master, mothers or stampers) found its way to the West Coast. That could be after the transfer of the bulk of Blue Note assets from NY to LA, or on an individual case basis. It would help if we knew there were Bert-Co copies of this title both with and without Van Gelder i.e. perhaps pressings made at different times or by different plants. Exasperatingly, some sellers don’t mention VG stamp because they are unaware of its significance: it may be present or it may not. If you have more anomalies, send them in. This investigation continues in two subsequent posts, where we unravel the mystery of the different makes of line-casting machines and their respective proprietary typefaces, as revealed on record centre labels, which links them with specific pressing plants. This entry was posted in Blue Note, Liberty and tagged All Disc Roselle NJ, Bert-Co Hollywood CA, Bestway, Bestway NY, Blue Note Division of Liberty Records, Capitol Scranton, Keel Mfg Hauppauge, Keystone Printed Specialties Scranton PA, Linotype by LondonJazzCollector. Bookmark the permalink. ‘B.A.’ on Liberty/United Artists recuts of Blue Note material, was Bert Agudelo (an alternate signature was ‘BERT’). Other cutters at that studio included Christina Hersch (initials CH) and Ralph Eck (who signed his lacquers with the ‘E’ looking almost like the logo for General Electric). There was another pressing party to this whole Blue Note hubbub: Columbia. Around 1967 some Columbia pressings of Blue Note product began turning up, apparently via the Columbia Record Club that handled Liberty at that time. 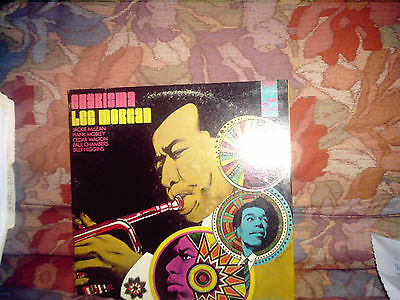 Most LP’s were recuts, made by Columbia Recording Studios in Hollywood (monos were on a Scully lathe designated ‘M-3’, stereos on another Scully known as ‘S-1’). Lacquer cutters (who did not initialize their lacquers in the deadwax) included Bill Brittan, Jack Andrews, Jack Lattig and Don Thompson (a partial list, I know). One title (“Alligator Bogaloo” by Lou Donaldson, BST 84263) was stereo but had the mono “Microgroove” label. 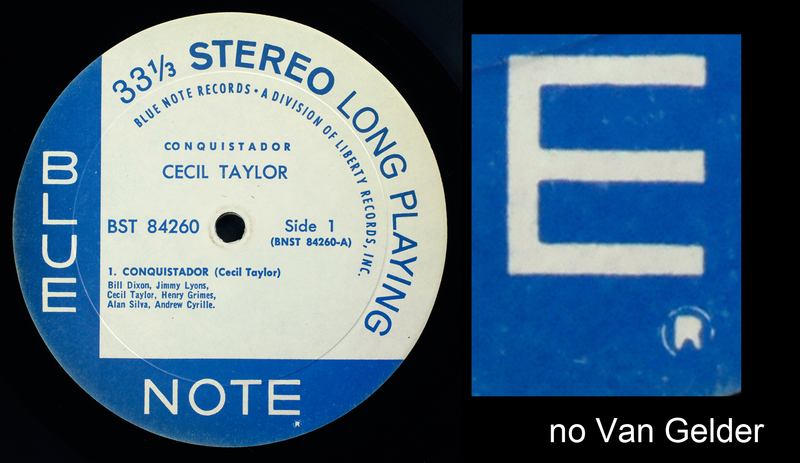 Incidentally, Keystone radically changed their typesetting arrangement for Blue Note LP’s in late 1968. The last with the “old style” layout was supposed to be “The In Between” by Booker Ervin (BST 84283); the fonts they used changed effective with BST 84284, “Bout Soul” by Jackie McLean. However, Stanley Turrentine’s “The Look Of Love” (BST 84286) was set “old-style” too. But Ornette Coleman’s “Volume 1 – New York Is Now” (BST 84287) straddled the fence – using older fonts for the small type, but using 12 point Futura Medium rather than 14 point Vogue Bold for the artist name and cat. #. ‘T’wasn’t until BST 84290 – “Think!” by Lonnie Smith – that the newer label type formula by Keystone was set. In passing, do you have any views on the possible Liberty / Tennesee – Southern Plastics/Dixie connection? Those die pressing marks are so distinctive, and I haven’t found anything closer than the Ø 1.18″ central groove on some Liberty/ Chess/ Veejay/similar? Southern Plastics didn’t press LP’s per se. There were a couple in Nashville that did – Nashville Record Productions, Precision Record Pressing, Standard Record Pressing and Mid-South Record Pressing (the last-named, later GRT Record Pressing). P.S. It was 1967 when Transamerica (which acquired United Artists in 1967, the year before they added Liberty to their portfolio) added Southern Plastics (for 45’s) as one of their array of plants. Southern pressings of UA 45’s began turning up around late 1967/early ’68. There was an LP plant affiliated with/owned by the same people that ran Southern. After ’68 was when both Nashville plants would have pressed Liberty and sublabel product – including Blue Note LP’s. Also, all the examples shown would have used hot-metal fonts. 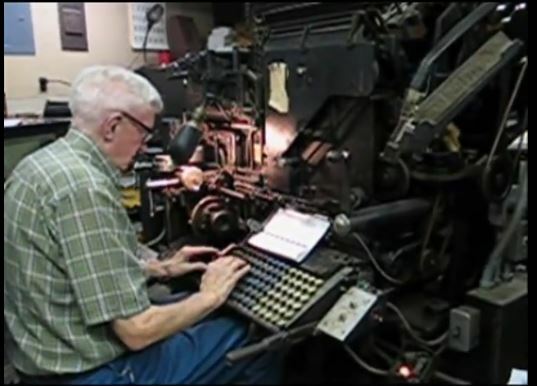 Linotype was used by Bert-Co (and by Columbia Pitman). Keystone’s hot-metal type was from a rival company, Intertype, whose machines also accepted Linotype “magazines” (those boxes which contained the individual characters and were mounted onto the Linotype or Intertype machines). there is another version of alligator bogaloo. I have a stereo version with the printing just like the Columbia pitman pressing but it is on a stereo label…. This one relates the Liberty label, but moreso the vinyl behhind it. In most Liberty labels there is a distinct hard and narrow raised “ridge” near where the deep groove used to be. I’m not sure how the label is adhered to the vinyl, but it could be the ridge is made before or in the process of adhering label to vinyl. Look for a slight shadow line where the deep groove should be and press a finger into it and you may find the hidden groove! What it means? No idea, but more grist for the mill. Thank you for this wonderful and exhaustive post. Reading (and rereading) this post has enhanced my knowledge of the Liberty era, and greatly improved my ability to separate the good from the bad when looking for LPs. Thank you for the countless hours you put into these studies for us audiophiles. It is greatly appreciated! your work has helped me get to now my jazz collection better and inspired me to purchase titles that I wouldn’t otherwise have considered. I am a photographer and have a method of correcting image color ‘cast’ from all lighting sources. I am happy to share it with you if you’d like it. Any pointers on correction of colour casts – which especially bedevil Ebay seller pictures – please, feel welcome to share. For what it’s worth: I have two non-Van Gelder Liberty’s, both stereo and at the time of issue ‘new’ releases; The Spoiler (84256), and Blackjack (84259). Both came to me from the same source, from California (and cost more than they where worth to ship here and then clear customs). The Spoiler has the classic hallmarks of a Bert-Co label, Blackjack is the same in every regard except that ‘Side’ is upper/lower. Also, both appeared to be unplayed dead-stock (lovely condition), so a solid case for West Coast pressings, probably 1st run. Both are great sounding records, but then I don’t have Van Gelder East Coast versions to compare too. From a collectors point of view (well, mine anyway), Van Gelder mastered is preferable, but these sort of records don’t turn up that often over here, as you know, so ‘any port in a storm’ as it where. Exactly how much difference it makes, and in what ways, requires one title with a copy of each for an A:B, which not unexpectedly I don’t have – yet. But it should be possible. Just out of curiosity, were Blue Note titles of this era ever available through a record club? I know I’ve never seen a title with the tell-tale Capitol Record Club markings (SMAS-8-* catalog, “Mfd. By Capitol” on label) but if one of the other clubs carried Liberty titles, maybe that would explain some of the mystery pressings? Well, there goes my theory. Heh. Regarding “metal travel” between the coasts: My only mixed RVG/ non-RVG is a Bert Co. Cecil Taylor “Unit Structures.” Are there also mixed East Coast Keystone Liberty albums? Did non-RVG West Coast metal also travel East? I found just four Liberty Van Gelders (out of 66 Liberty Van Gelders) with what are clearly Bert-Co labels. Now either metal travelled west, or quite possibly the reverse, some batches of labels travelled east. Why, heaven only knows. It would drive you mad if you weren’t well on your way there already! My suspicion is that towards the close of the decade, Liberty became much more West-centric. That is where the HQ was, Transamerica was the new boss, and United Artists at some point started using Van Gelder metal. Perhaps Blue Note assets were being relocated there. My takeaway from this post is the idea that there were Van Gelder and Non-Van Gelder Blue Notes released simultaneously making both “original” issues. I had always considered Non-Van Gelders to be later issues – when there was an existing Van Gelder of the same title. I have a copy of Shorter’s Adam’s Apple which is a Bert-Co with no Van Gelder stamp in the deadwax. The cover, however, has a debossed “NOT FOR SALE – PROMOTION USE ONLY” stamp. This has always seemed a little confusing. Hi Peter, my original assumption was the same as yours, but more intensive examination suggests not, merely an east coast/west coast division of labour. I came across promos and audition copies of both east and west coast origin. With a national release date for each new title, the Liberty sales people will have rushed locally-manufactured advance copies to local radio stations, which makes a sort of sense. I have 2 mixed liberty / NY USA labels in my collection. 1506 and 84164. Both have the large non deep groove pressing ring and both have the title in capital letters. maybe these are all – disc pressings? Hi Ed, please see latest additions to the knowledge at foot of post. A lot depends on whether the title is in large or small capital letters. I know that sounds nerdy, but that is where I have ended up. Keystone/Van Gelder are only small caps for album title, large caps for artist. You need a digital VERNIER gauge. However, for imperial measurements it will only read to 4 decimal places. A press of a button will covert to metric. I’ve been a lurker for years, never posted, but I just wanted to take a moment for a polite bow and to say, thank you, sir, for the valuable research you are providing in this understudied field of jazz-vinyl-collector-nerdery. I’m sure there are many others here who just lurk, rarely or never post, but that doesn’t mean your work isn’t appreciated. thanks for the heads up on the Booker Tyra tune, will get around to the rest of the lp some time soon. Must check through my BN labels one of these days as well, a 57 varieties of a collection so far. Do any of there 35 Pre-Sale Libertys exist without the Van Gelder stamp? I started looking at all of mine but hadn’t;t come across one without the stamp. Can’t speak for others, but I have just about every one of the pre-sale thirty five. Not one has the ear, but every one has a van Gelder stamp. Liberty used RVG masters for metal parts, and channeled the pressing programme through All Disc, which ensured continuity. Eventually there were Division of Liberty reissues on West Coast without stamp, I guess. Looks like your latest research on Shorter’s Adams Apple indicates that there are non-Van Gelders out there, Looks like I need to add another category to be Liberty record database listings. That’s very clever of you to notice such a simple relationship. They only measured out to 1/64” accuracy, which is not all that difficult. I was inspired by your previous incites about Blue Note Liberty and began searching for information about companies pressing records and printing center labels and jackets. Your latest article which arrived in my mail box last night has me bouncing off the walls! ABBEY ROAD CONNECTION! let me know what you think! no one in their right mind has a tool that measures to six decimal places in inches. and all tools of that sort that i know of wouldn’t work on a label ring anyway. silliness. still, wonderful info. i will have to compare what i have! Mixed labels, that’s a first. Any chance of a picture of each side? Email them if you can. I want to collect up all the anomalies before taking stock,. I’ve been here before. Some anomalies are structural – they indicate something different was going on and we haven’t quite figured out the right story yet. Other anomalies are just that, anomalies, we’ll never figure out why. For example, there was one time the union of machine operatives went on strike, and the label turned to a non-union plant to press some titles. Strike over, business back to usual, that sort of thing. Or one printer employed two typesetting operators, each working in slightly different ways. Some things we will never know. Me too! The same on my copy of BST 84273 (Hi Voltage – Hank Mobley). There is no circle around the “R” trademark on labels, but it has a Keystone “Side 1” and Van Gelder Stereo stamp into the dead wax. What do you think about that? One more anomaly? Thanks! ….in addition, the weight of the vinyl is 158grams and it sounds great, an astonishing sound! Information overload. You Sir deserve an award for this post. Great job! You can buy a cheap dial caliper to read .001 or .0001. The label info showing a 6 decimal reading I think may be a typo? Unless this guy is making o-rings for the space shuttle in his spare time. Just found your blog today, and I’m really enjoying it. Will attack the rabbit hole of back posts more in time. I’m a music before minutia person but I’m not immune to some mild fetish-izing of these old records. Anyway, thanks for the read….